2. On the “Edit” menu, point to “New”, and then click “DWORD Value”. 3. Type “ScheduleAccelerator” (no quotation marks) as the entry name, and then press ENTER. 5. On the “Edit” menu, click “Modify” or just double click ‘er. 6. In the “Value data” box, type the value that you want, and then click “OK”. To determine the polling interval, the value that is configured on the “Scheduling” tab in the GUI is divided by the value that you type for the ScheduleAccelerator entry. Assuming you already have this at 15 minutes, the value you put in here would divide 15. 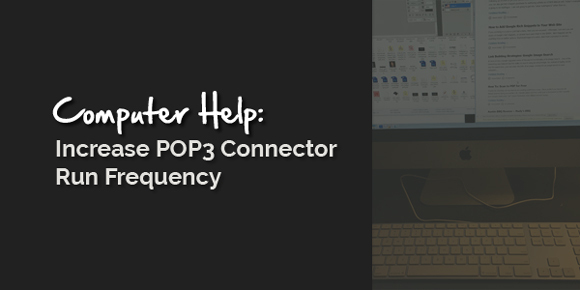 So, if you enter 5 the POP3 Connector will check for email every 3 minutes. Boom. FYI, you can enter the value as Hexidecimal, which should be the default. 7. I then restarted the POP3 Connector Service by going into the Services console, finding POP3 Connector, right clicking it and selecting restart. I would really recommend instead to use a third-party POP3 connector, the service included with SBS is not designed for a short download cycle and is unreliable. There are two free options I know of: E.F.S. and PopGrabber. PopGrabber (http://www.eclarsys.com/popgrabber) has the advantage of running as a service but the free version is limited to 3 accounts.